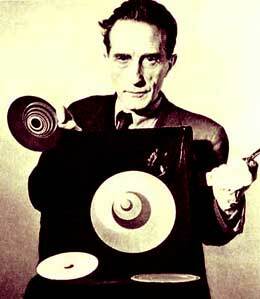 Hans RICHTER (1888-1976). Painter, graphic artist, avant-gardist, film-experimenter and producer. First contacts with modern art in 1912 through the "Blauen Reiter" and in 1913 through the "Erster Deutsche Herbstsalon" gallery "Der Sturm", Berlin. In 1914 he was influenced by cubism. Contributed to the periodical Die Aktion in Berlin. First exhibition in Munich, 1916. Die Aktion published as a special edition about Hans Richter. In the same year he went to Zürich and joined the Dada movement. Richter propounded the thesis that the artist's duty was to be actively political, opposing war and supporting the revolution. First abstract works in 1917. Friendship with Viking Eggeling in 1918, the two experimented together in Film. Was co-founder, in 1919, of the Association of Revolutionary Artists ("Artistes Radicaux") at Zürich. In the same year he created his first "Prélude" (orchestration of a theme developed in eleven drawings). In 1920 he was a member of the November group in Berlin and contributed to the Dutch periodical De Stijl. In 1921 he made the first abstract film, Rhythme 21, which today is considered a classic among avant-garde films. About Richter's woodcuts and drawings Michel Seuphor wrote: "Richter's black-and-whites together with those of Arp and Janco, are the most typical works of the Zürich period of Dada." From 1923 to 1926, Richter edited, together with Werner Gräff and Mies von der Rohe, the periodical G. Material zur elementaren Gestaltung. Hans Richter wrote of his own attitude of films : "I conceive of the film as a modern art form particularly interesting to the sense of sight. Painting has its own pecular problems and specific sensations, and so has the film. But there are also problems in which the dividing line is obliterated, or where the two infringe upon each other. More especially, the cinema can fufill certain promises made by the ancient arts, in the realization of which painting and film become close neighbors and work together." In 1957, Hans Richter finished a film named Dadascope with original poems and prosa spoken by their creators: Hans Arp, Marcel Duchamp, Raoul Hausmann, Richard Huelsenbeck, and Kurt Schwitters.